Adelheid‘s what it’s like – on stage now at The Theatre Centre – is one of those shows that leaves me both exhilarated and totally bewildered as to what to say about it. As is typical of The Theatre Centre, calling it a performance feels stingy. what it’s like was an engaging, immersive experience. It aims to bring us, the audience, into a shared space, to both witness and challenge our notions of comfort, agency, responsibility, complicity, and brotherhood. I’m not sure that’s what happened, but I am sure it was a pretty incredible night. I tend to want to come away from a show with an easy answer to “what was it about?” I don’t have an easy answer here. In that sense, I feel very challenged. This is an event that will stick with me for a few days, for many reasons. There were numerous unique elements. The mysterious build up – from the bags we were handed upon arrival (and what they were used for), to the video preamble about trust before entering the space, to the big reveal within that space (no, I’m not revealing what it is) – all gave me a sense of anticipation. This uncertainty and excitement is something I’ve come to expect from The Theatre Centre, and they do it very well. The staging and seating was seemingly random, and scattered. My companion Jibreel – ever the rule-breaker – moved a chair so we could sit close together. I felt encouraged to speak out if I wanted to, to sit where I wanted, to be free (at least freer than in a typical theatre setting). I’m not super familiar with contemporary dance. It’s an art form I’ve rarely experienced, and I wondered throughout the show if this was preventing me from grasping the point. Was I watching various portrayals of brotherhood, from familial alpha battles to the dynamics of soldier-brothers-in-arms? I sensed conflict, resolution, passion, loyalty, love, fear, even terror embodied in the dances. Which brings me to the incredibly talented dancers. Michael Caldwell, Luke Garwood, and Naishi Wang are generous, extremely physical, and talented performers. I’m not a dance critic, but to me they seem to possess incredible balance, range of motion, flexibility, and most importantly, they performed very well together. Kind of like brothers. They made me feel things I’m struggling here to express with words. Other remarkable elements were the sound and lighting, masterfully executed by Jeremy Mimnagh and Simon Rossiter, respectively. They added such richness, drama, excitement, and tension to the whole experience, and the lights also divided up the space. I also got to experience the sound magic on a personal level because I can never stop my hand from shooting up when a volunteer is needed. Again, not telling as I don’t want to spoil anything, but when the headphones told me what I was going to be doing, I was terrified. Again, challenged. 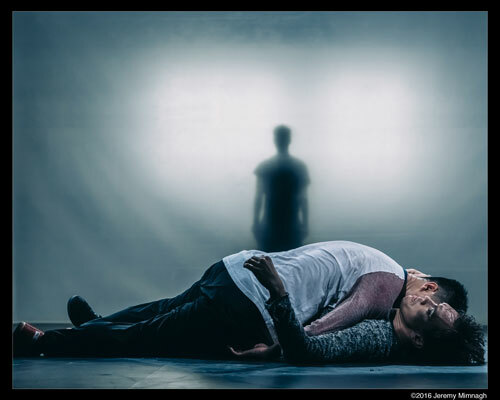 what it’s like is extremely ambitious in terms of performances, staging – with multiple different areas being transformed during the show – and in challenging the audience’s comfort. There is only one negative, and it’s a relatively large one. If you have limited mobility, The Theatre Centre suggests getting in touch with them. To fully enjoy this experience, you must be able to either stand or sit on hard floors in small spaces for roughly 15-20 minutes. Despite having a fairly severe knee injury, this only slightly impacted my enjoyment. Overall, while I’ve failed to express here what this show was all about, and while I feel that I may have also failed to grasp some deeper themes during the performance, I – and Jibreel – thoroughly enjoyed it. If you’re someone who is deeply entrenched in a comfort zone, what it’s like may jar you. If you want to feel something exciting and don’t mind a bit of confusion, give it a try. I am not affiliated with Salt, but I must say how amazed at how many favourable reviews I read in Mooney that make zero mention of the director. Briana Brown is mentioned here but only as the projection designer. Plays do not direct themselves. All of the other things that you mention liking are part of her vision. There is no credit to the director of What It’s Like in that review either. MOT reviewers do this over and over again.